Looking for something to do this Sunday? Planning on getting married in 2017? Then come and visit us at the Bridal Show and Wedding Expo in Augusta. The show will be at the Augusta Armory this Sunday 22nd from 11am-3pm, and we will be offering special discounts and promotions for those attending which is a great way to save money on the best wedding DJ, photo booth and officiating services in Maine. 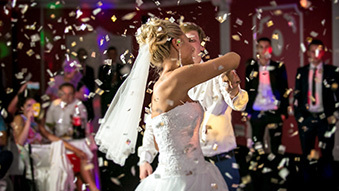 If you can’t wait and want more information on our wedding services now, visit www.whitecateweddings.com for full details of our wedding services. It’s you special day and every part of it should be so. Our wedding services make that our number one priority.